Two versions of the A.E.G. 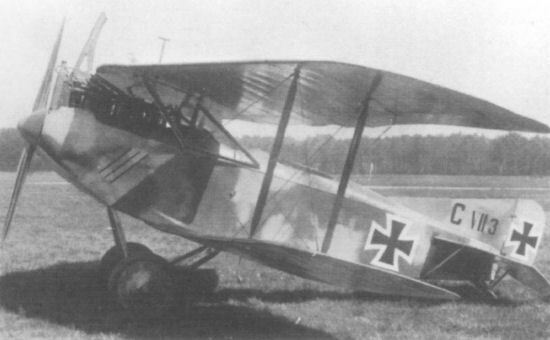 C VII appeared, in December 1916. Both were single-bay machines, with basically similar fuselage and tail, but one was built with straight wings and the other (illustrated below) with a heavily swept upper wing and a large spinner on the airscrew. Engine, 160 h.p. Mercedes D III. Span, 11.1 m. (36 ft. 5 1/8 in.). Length, 6.2 m. (20 ft. 4 1/8 in.). Weights: Empty, 758 kg. (1,668 lb.). Loaded, 1,118 kg. (2,462 lb.). Speed, 165 km.hr. (103.12 m.p.h.). Climb, 1,000 m. (3,280 ft.) in 4 min.